Bettie and I have a restaurant we like to go to on the edge of Bloomfield, Iowa for their chicken livers. While I do fix them at home, this recipe from the Southern Living cookbook was an attempt to see if I could come close to theirs. These are really good, but still not just the same. However, we liked them quite a lot so will fix again. I did change the ingredients after I tried this as there was not enough flour and too much butter, oil. Our Fareway store sells their chicken livers in the frozen meat counter from the chickens they roast for sale. Inexpensive and good eating. Combine flour, salt, and pepper; dredge livers in flour mixture. Heat oil and butter in skillet; brown chicken livers. Remove from skillet and set aside. Saute onion in pan drippings until tender; add mushrooms and cook until tender. Return livers to pan; add sherry and simmer 6 to 7 minutes. Sprinkle with parsley. Yield 4 Servings. Onion 50 cents, Mushrooms 1.29 (on sale), Chicken livers 1.17. Total 2.96 or .74 per serving. What a bargain. Oh, yes. This looks good....lunch? 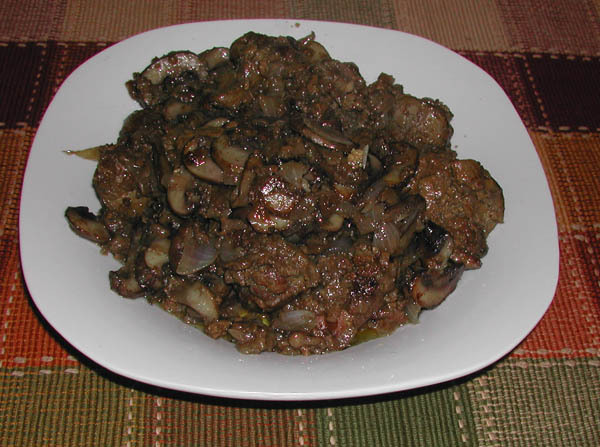 I used to make chicken livers sauteed with mushrooms and malt vinegar (the kind you have fish fish and chips). It was so delicious. Also, I liked them even though they weren't breaded. The taste was unusual and addicting (for me.) I love chicken livers and your recipe looks so good. Hi Sandy. Glad to hear from another chicken liver eater. Not so many of us out there. I think I am going to try your idea as I like malt vinegar and that sounds goo to me.